Digital photo frames hit the market about 10 years ago, and have maintained their spot as a popular device, which allows you to view and store all of your photos conveniently. Digital frames were over-complicated at their launch, which cut-out a large chunk of the potential consumer base. And this included older relatives who love to receive photos of you and your family. However, the best digital photo frames are now very easy to set-up and use! For the easiest upload of images to digital frames, look out for frames with a USB or SD card system for storage. Family/friends can then give ‘externally-stored’ photos to digital photo frame users, who just plug-in the pen-drive or SD card to the digi-frame. And that’s all you need to do to see your photos in seconds! In addition, check that any remote-control unit is simple to handle and that menu navigation is clear and easy to follow. A good remote control unit is perfect for folks with mobility problems, who can’t be getting-up and sitting-down every few minutes. And you should choose a digital frame that you can add new photos to very easily. If screen clarity is important to you, buy the highest digital frame screen-resolution you can afford. A 4 – 8 GB SD card/USB pen-drive will compensate for a digital photo frame that has little or no internal storage space, holding many thousands of images. And remember that videos and music files use up more storage space. So if you’re ready to go, let’s explore the best digital picture frames right now! 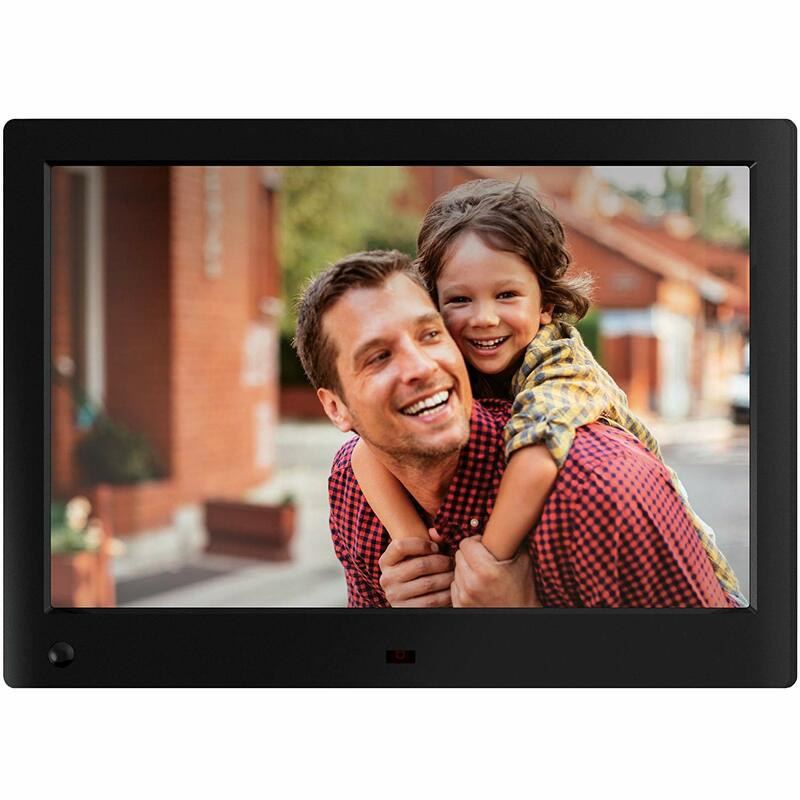 Showing crisp images absolutely free from any blurring, made this our overall favorite digital photo frame. The clarity of the photos is second to none and the colors are vibrant, but true. It’s a ‘table-top’ photo frame, rather than one you can mount on a wall. So it’s intended to grace a desk, bookshelf or side-table. 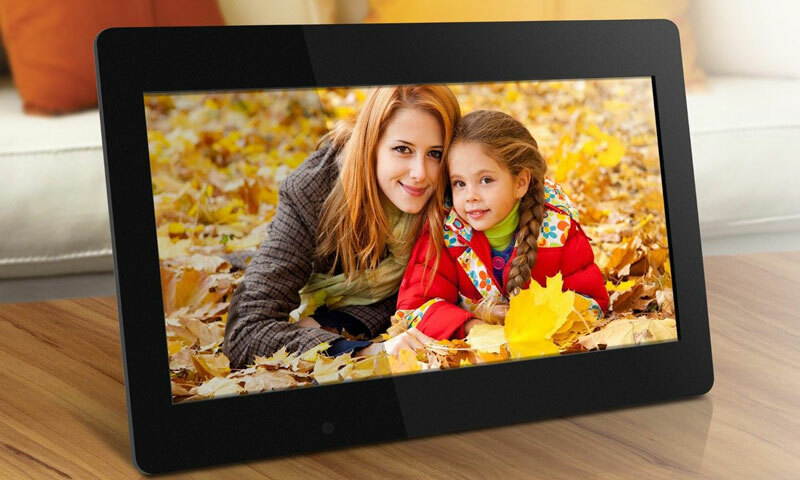 It also looks attractive, with a smaller frame margin than other digital photo frames. This means it doesn’t just look like you’ve left a ‘tablet’ running on your side-table. The remote is compact and the frame’s interface is incredibly simple to understand and use. It’s very easy to view videos, or select particular photos, with a couple of clicks. You can upload your personal videos, shot on an android mobile phone, in seconds. And enjoy outstanding sound quality as the video plays smoothly! This model also scores very high on ease-of-use for anyone who struggles with new technology. Instead of having to connect the digital frame to a p.c. when you want to transfer photo images, you use either an SD card or the USB socket. This greatly simplifies the loading and display process, and you can send an SD card full of your latest photos in the snail-mail to friends/relatives. And they can plug the SD card straight into the frame, with no fuss or fumble! As it doesn’t depend on a p.c. connection, the NIX Advance digital photo frame has no internal storage. However, you can’t connect it to a wi-fi system and access sites like Instagram, YouTube and Facebook. 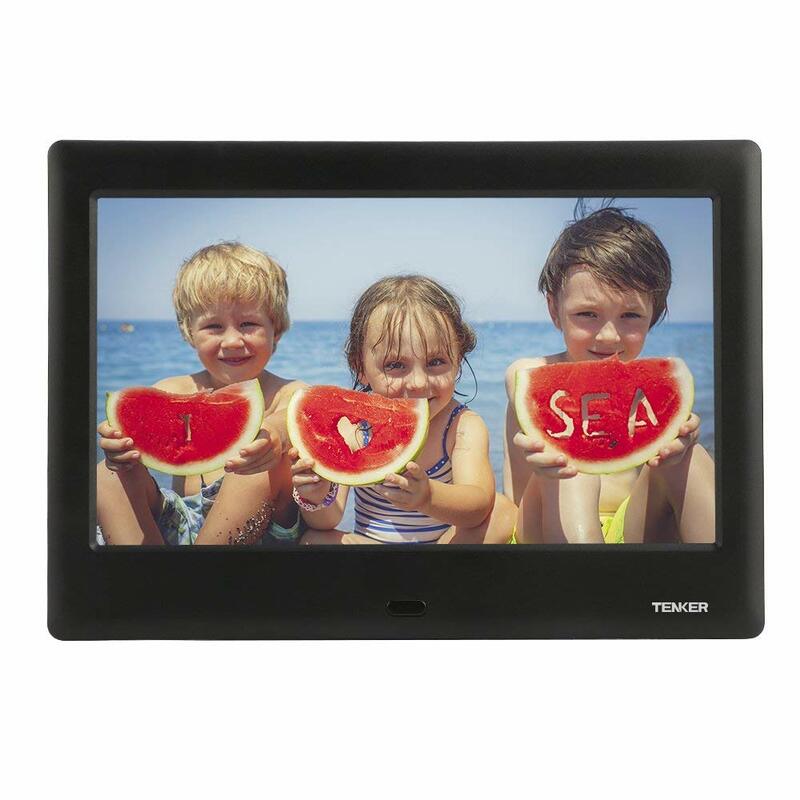 If you’re just looking for a basic digital photo frame that can display slides, and videos plus music, the TENKER 7 is just what you’re looking for! It doesn’t offer perfect quality image display, but it works well for a very reasonable price. At modest 7-inches, this digital frame is smaller than more expensive models. But it’s quick and easy to set up in seconds by screwing it to the stand. Like the NIX Advance, this frame is designed for use without a home computer. So there’s no internal storage and you’ll have to buy an SD card or USB to carry your images. However, this is a huge an advantage for folks who find modern technology a challenge. You just plug-in an SD card to play photos or videos taken with an android mobile phone. Image reproduction isn’t perfect, and we found pixelation did affect our enjoyment of certain images. However, you can upload any Mp4 videos you have on your android to this digi-frame with no difficulty at all. The quality of sound and vision on movies running on this frame is certainly very good. The remote control unit is compact, but over-burdened with too many buttons. However, the interface is very easy to navigate, which is crucial for everyday use by non-techies. 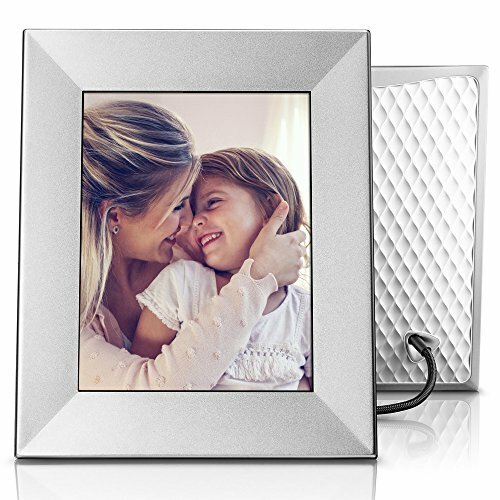 This compact photo frame is great value for money and suitable for basic requirements. The Aluratek has 4GB of internal storage, which is quite a small amount compared to other digital frames. But it is versatile, because you can use the USB and SD card sockets to add as much storage space as you need! You can upload photos to the frame when it’s connected to a power-source and a p.c. – with the rather short USB cord. However, we found that using a camera card or USB connection were easier ways to upload images. And uploading music files and videos was totally trouble-free. Photos and videos display clearly, with good color-balance, and no pixelation spoiling your view. We enjoyed the good sound reproduction, too. The remote control unit is simplicity itself, with just a few buttons, so seniors will be fine using this model. Another point we liked is the low level of screen light-reflection. This makes it easy to position the Aluratek frame on a wall, or table, without having to avoid specific light sources. And set-up is just a matter of attaching the cable and plugging-in the digital frame! 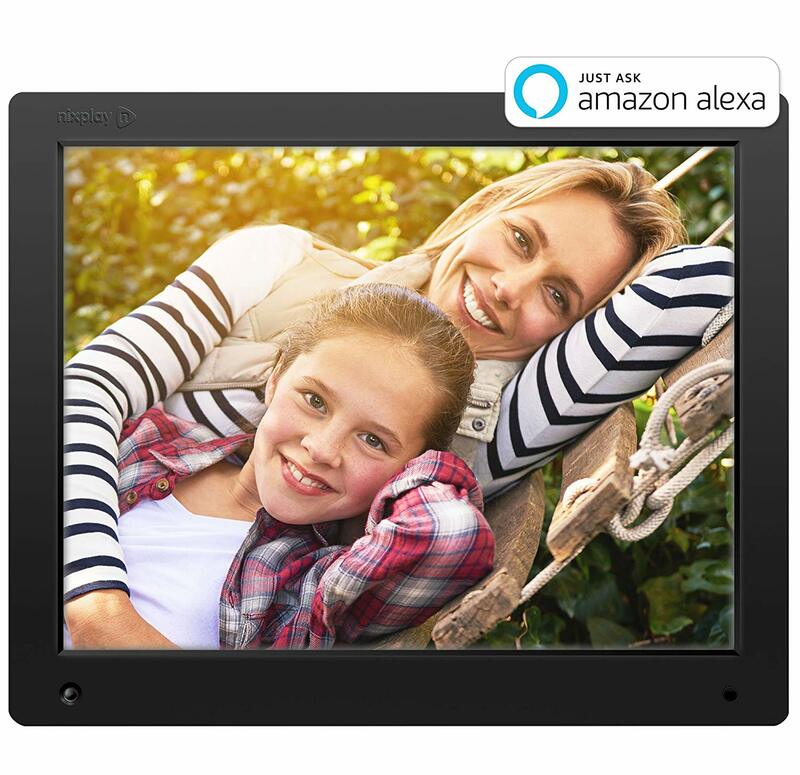 So this is a good-quality, mid-range, digital photo frame for non-technical users. 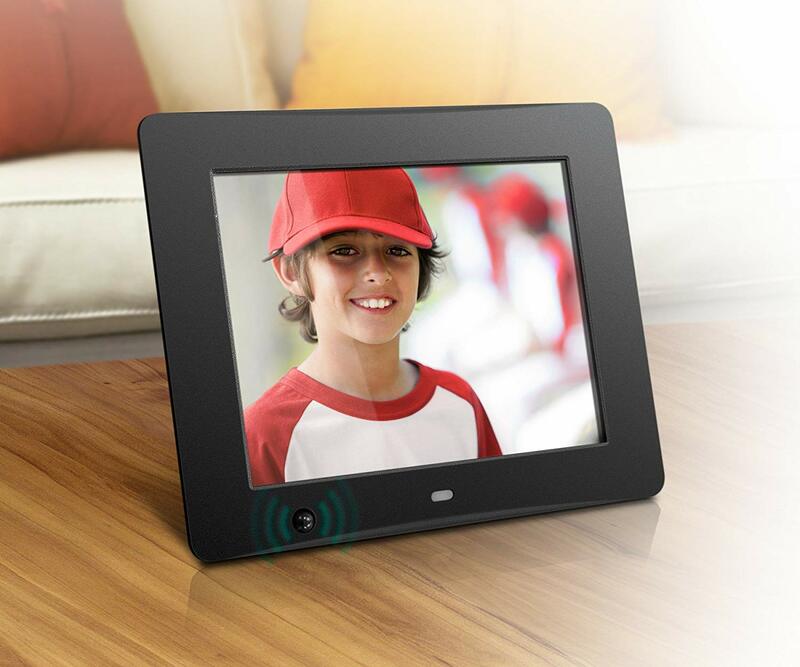 This is a more ‘professional’ digital photo frame that uses wi-fi, so you can access any internet photo collection. And this includes Instagram, Smugmug, Flickr, Dropbox and Facebook. With its own email address, the FotoConnect can receive new images from your phone, and send images out to your contacts. And the Pix-Star comes with 4 GB’s, which is plenty of internal storage, which you can also increase using the SD card slot/USB opening. And increasing its similarity to a tablet, this digital photo frame has a larger screen, measuring 10 ½-inches. It’s well-designed, with an energy-saving, motion-sensor that keeps the screen dark until someone enters the room. In addition, the large, remote control unit is easy to manipulate. And to save you misplacing it, there’s a storage place for the remote on the back of the device! This versatile photo-frame can be hung on a wall or placed on a table top. The photo display quality is first-rate, although a perfectionist may notice white edges to some photos. But overall, the Pix-Star is obviously a great business tool, as well as a snazzy, electronic photo-album for personal use. Silver Iris 8″ Wi-Fi Cloud Digital Photo Frame with IPS Display, iPhone & Android App, iOS Video Playback. If substance and style are important to you, take a look at the Nixplay Iris. The design emulates traditional photo frames, offering a choice between silver, burnished bronze or peachy-copper. And that makes it easy to match with your home décor. This model has 8 GB’s – the largest internal storage space – where you can store and view thousands of photos. With so much internal space, there’s no provision for an SD card or USB pen-drive for extra storage. This luxury product provides top-class image clarity and color-balance. And we all loved the cable, designed to double-up as the stand, which streamlined the look. But the Nixplay can’t be wall-mounted, so this is strictly a flat-surface device. Furthermore, you can’t play videos on this device and it isn’t as sturdy as some other digital photo frames. And although it has no wi-fi, and only basic functions, users like the many ‘transition options’ available to edit photos. This attractive digital photo frame will enhance your décor, and provide the largest internal storage space for thousands of photos. We hope that getting to know the pros and cons of the 5 Best Digital Photo Frames has made it easy for you to choose the best model for all your needs! And now the new digi-frames are so easy to use, they have shot up the list of popular gifts for men, women and all age-groups!